This weekend wasn’t our usual dark sky new moon weekend; there would be a third-quarter moon rising just at midnight. 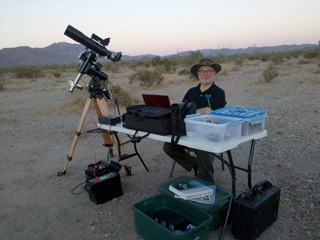 With summer sunset at 8:00, and no real dark sky until about 9:00, we were looking at a really short (for us) desert observing session of about three hours. Next week is when all the big June star parties are being held. The weather was fair, not too awfully hot, or too awfully windy, just a little of both. The sky was brilliantly clear, and seeing was not particularly good. Sometimes we just say WTF. This was one occasion when I was glad to be living “in the future.” I somehow managed to completely wedge the ASCOM driver that lets my laptop communicate with the telescope mount. That’s the kind of thing that really eats up the clock when the moon is about to chase away your dark sky! Right there in the middle of the desert, I was connected to the net by USB tether to my Motorola Droid. (Thank you PDANet!) I posted a plea for help on the Astro-Physics User Group mailing list. The author of the driver responded to my post and helped me set it right within an hour. 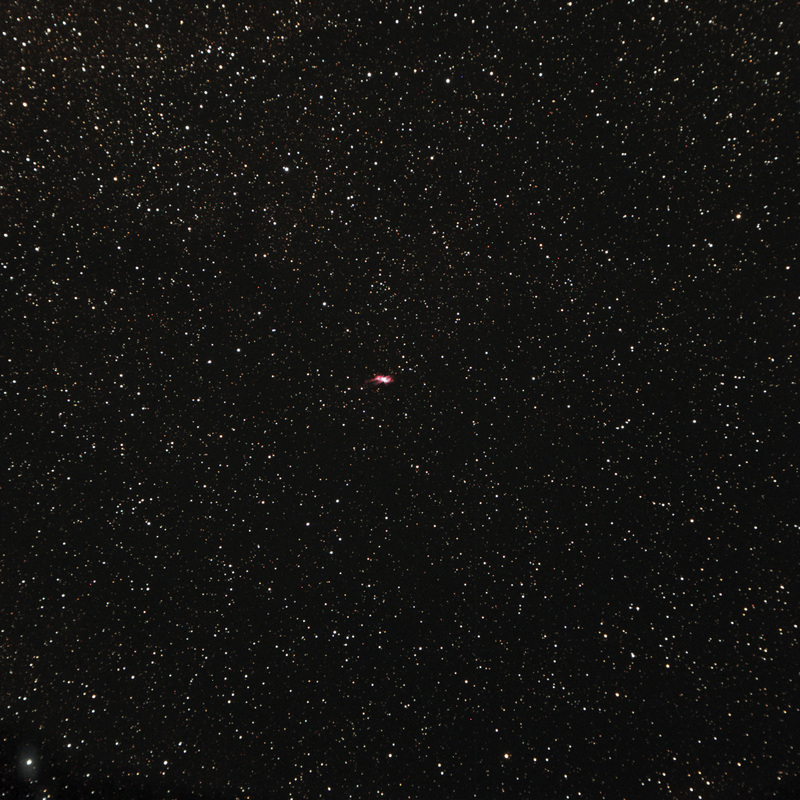 I had time for maybe two short exposures of a couple of objects, and Jane badly wanted a piggyback shot of Scorpius. That would be my first priority, and I had fun shooting it. I used a fixed-focus 35mm f/2.0 lens on my Canon 20D, and the big constellation just barely fit in the frame. We have a fairly strong light dome to the south from the Inland Empire. 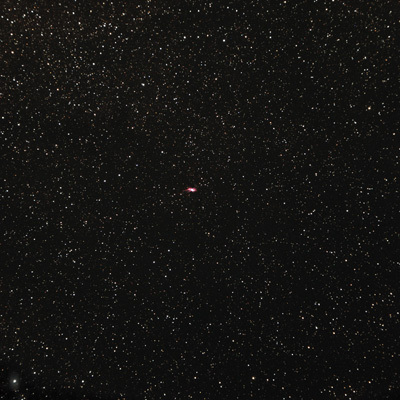 I cropped the shot just below the constellation where the light is strongest. 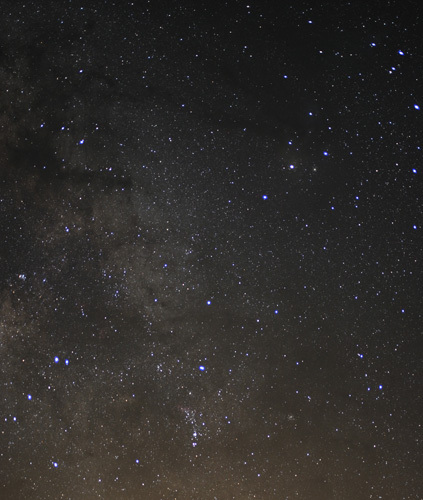 The fishhook of Scorpius fills the frame, with lots of Milky Way and dark nebulae throughout. Some light glow to the south. 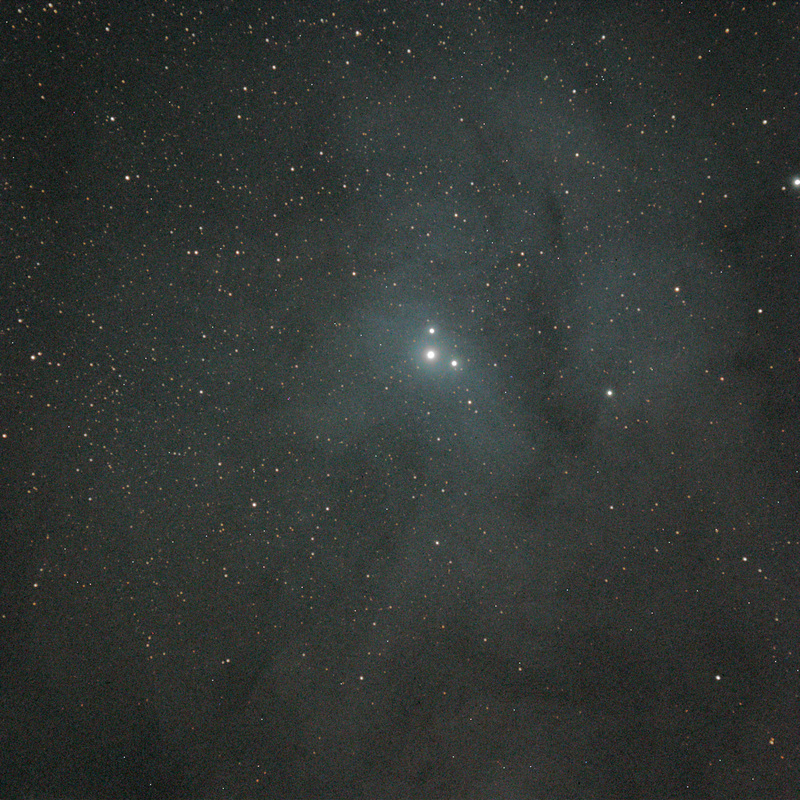 Jane had the “Bug Nebula” NGC6302 on her observing list, and I tried a shot of it myself. It’s a tiny thing relatively speaking, so there’s not much to see in the full field. There’s one interesting object in the lower left corner which could be another planetary, or possibly an artifact of my own creation. It only shows up well in one of my two sub-exposures. 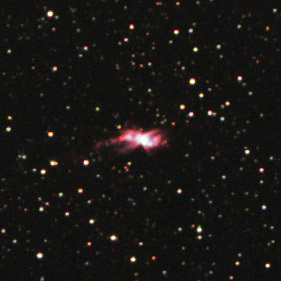 That little red blob in the middle is the "Bug Nebula." There might be another planetary in the lower left corner, that or an imaging artifact. Here’s a cropped version at full resolution of the bug itself. Jane’s view in her big dob was actually very nice. With only a little time left before moonrise, I wanted to see what I could get of the nebula around Rho Ophiuchus. It’s only one ten-minute exposure, and you’ll find lots of impressive images of this region out there on the net. I’m still tickled with what I was able to capture. Finally the moon put an end to the dark sky observing, but moonrise itself was quite an event. The moon was joined quickly by Jupiter to the south. Jane has a great afocal shot taken through the eyepiece of her Televue Ranger. You’ll have to see that one on her observing report! Moonrise with Jupiter over Chuckwalla Mountain. 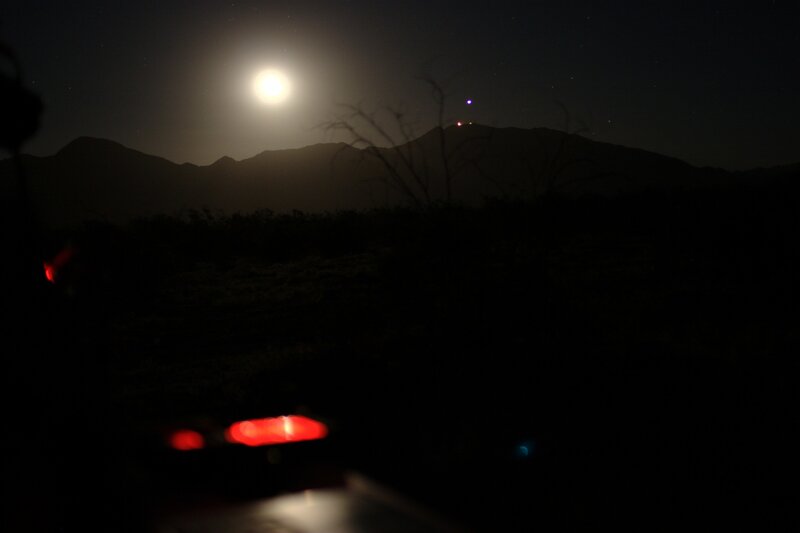 There's a light from the microwave station on Chuckwalla Mountain just below Jupiter to the right of the moon. Nice shots all the way. Looks like you’re having a lot of fun with it … but getting an answer “in real time” from the driver author is way kewl.